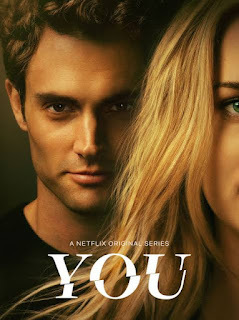 Another one of Netflix series came to my attention not so long ago and since it was only having 10 episodes, I thought it would be easy enough to finish. And indeed it was. I managed to finish the whole 1st season in 3 nights only. I was intrigued with the series since it was said to be a psychological thriller and had a good rating. Well let us get on now, shall we? Joe Goldberg (Penn Badgley - Easy A, Gossip Girl TV series etc) was working as a manager in Mooney's bookstore with another clerk named Ethan (Zach Cherry). One day a young woman named Guinevere Beck (Elizabeth Lail - Dead of Summer TV series etc) visited the book store and attracted Joe's attention. Feeling intrigued, Joe started to find out about Beck's private life by using various unconventional, even illegal and sometimes dangerous method & becoming like a stalker. I heard about this movie some time ago but completely forgotten about it until few days ago when I saw the poster in the coming soon section on Indonesia's biggest cinema chain website. Without any prior notification or trailer shown earlier, it suddenly popped out of nowhere and premier on last Wednesday. But since me and my wife were already invited to screening of new movie in another cinema, we postponed seeing this until yesterday. Well now we should get on with the movie. Hellboy (David Harbour - Stranger Things TV series, A Walk Among the Tombs etc) was a creature with super strength and working for Bureau for Paranormal Research and Defense (BPRD) to solve supernatural cases and fight against dangers they created. Hellboy's superior was also his adoptive father Trevor (Ian McShane - Deadwood TV series, John Wick: Chapter 2 etc). 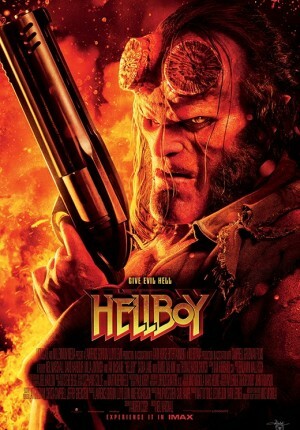 This time Hellboy was given a very difficult and dangerous assignment as he had to face against an immortal & powerful witch called Nimue (Milla Jovovich - Resident Evil series, Future World etc) who tried to destroy the world and humans in it while giving the demons chance to rule the earth. 2 days ago, my wife got the invitation to the press screening of this movie. As usual, we were always excited to go for a special screening (or press screening) of a new movie released in Indonesia since we would get the opportunity to see them earlier. However, this time it was a bit strange as the screening was held on the same day of its premiere date on 10 April 2019. But anyway, we were still enthusiastic to see this one at CGV FX Sudirman. And after a seemingly long time of preparation and tons of advertisements and few trailers, finally the movie started at 7.30 pm (quite far behind schedule of 7 PM according to the invitation). OK, let us go on with the movie now. 9 years after alien invasion in 2019, the world had been in the control of Legislators (aliens representative on earth). Some people who were part of a resistance group called Phoenix tried to fight against the aliens in their "lair" underground called Closed Zone, though they mostly were unsuccessful. 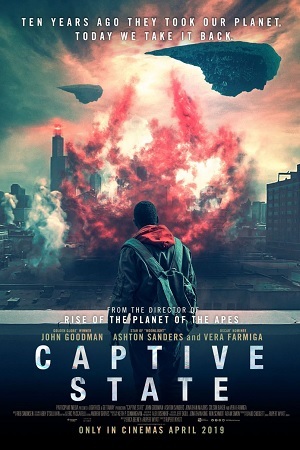 A young man named Gabriel (Ashton Sanders - The Equalizer 2 etc) who lived in the city of Pilsen had been wanting to get away from being harassed by Chicago police chief Mulligan (John Goodman - Kong: Skull Island, Atomic Blonde etc) who suspected Gabriel to be involved with Phoenix where his deceased older brother Rafe (Jonathan Majors - White Boy Rick) was a part of.